The effects of Hurricane Harvey are devastating and catastrophic. While those in the midst of it are suffering, many outside the areas affected want to help but may feel helpless. What to do? As believers in Jesus, we must first go to prayer and then to action. May we each hear the voice of the Lord speaking and leading us. The Bible teaches us to “love our neighbor” by helping him, not just in words but in action. You may be in some deep waters in life. Read on! Please consider GIVING to a christian relief fund serving the area like Samaritan’s Purse, Operation Blessing, Convoy of Hope or a church in the area. All of us can give something – whether small or large. If the Lord leads you to do more, like volunteer in the affected areas, either now or in the months to come, then contact an organization involved in relief efforts and make a plan to do that. Now let’s pray together: Our Father God we come to your throne of grace on behalf of those suffering as a result of Hurricane Harvey. We ask you to bring help and comfort. May the Body of Christ, the Church rise up to be your arms and feet in bringing hope, love, compassion and care to hurting souls. Lord, as I sit in my safe home I cannot imagine the level of devastation but my heart reaches out with tears. Father, you tell us that you are a safe refuge and that your everlasting arms are always underneath. Father, I pray that the people of Texas and Louisiana will run into your arms and know that safe refuge. May hearts be turned to you today in Jesus name. Please lighten the burdens O God. Help all the workers and those organizing relief to streamline their efforts and know what to do, where to go, and what to bring. Give great wisdom and great strength, emotionally and physically. We turn to your Word O God for encouragement and hope. Your Word says that “the voice of the Lord is over the waters.” Father may your voice be heard in the midst of this devastation. Your voice gives direction, brings encouragement, gives hope and spreads love. Open ears to hear you, turn to you, trust you. 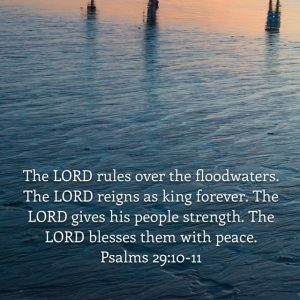 Despite this terrible devastation we declare what the Scriptures say “The LORD sits enthroned over the flood; the LORD sits enthroned as king forever. May the LORD give strength to his people! May the LORD bless his people with peace! ” Amen. YOU may not be in the areas affected by Hurricane Harvey, but you may be in some very deep waters yourself – maybe physically, emotionally, mentally, financially or spiritually. 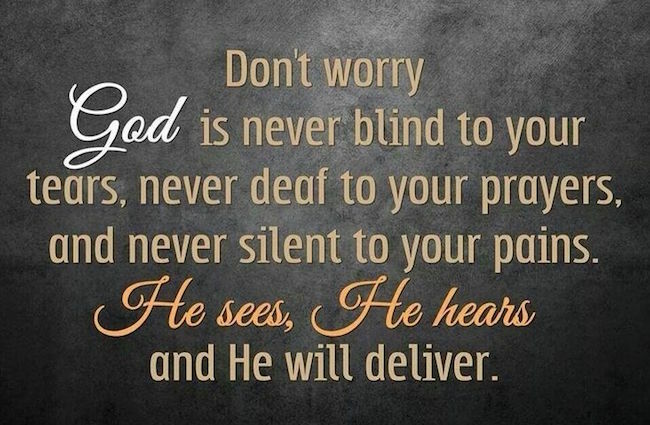 Know that these prayers are for you also! This Word is for YOU!. 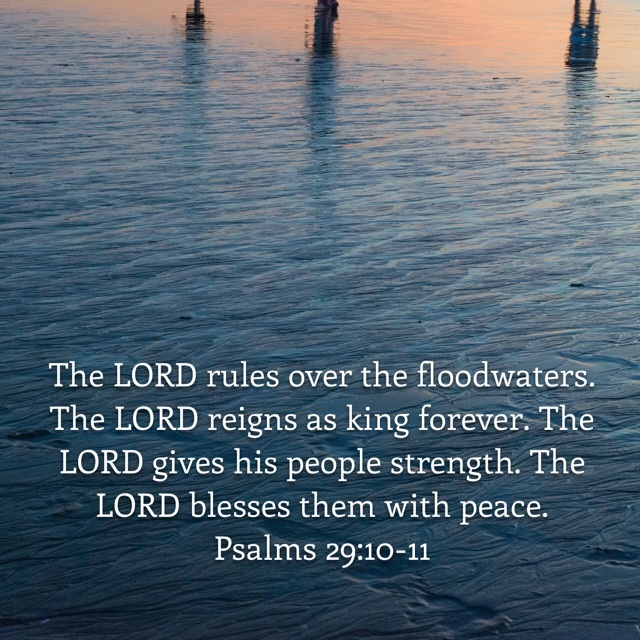 God’s Voice is over your waters too and HE will lead and direct you. 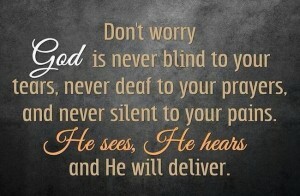 We are praying for you also! I encourage you to continue to pray daily for others and yourself.. The people affected by Hurricane Harvey are experiencing a major life trauma that will not go away tomorrow. We must continue to pray and act, and not forget them. Let us continue to hold up weary arms and hearts. Thank you for praying, giving and caring. You are remembered too before God’s throne of grace. At Women of the Word we are committed to continuing in prayer for this situation, for our nation, our leaders and the Body of Christ. Please join us! What does Hurricane Harvey mean to the Church? What could God be saying to His Church, the Body of Christ (Corpus Christi) through Hurricane Harvey? Is God speaking to the Church about the dangers of complacency and apathy? An article in USA Today entitled “Corpus Christi breathes sigh of relief….” reported “Emergency coordinators have said for years that complacency could be dangerous for Corpus Christi, describing residents’ responses to storm warnings as apathy. “ Many residents stayed in the city, dismissing warnings. They did prepare some by boarding up homes and stocking up on supplies. The prevailing attitude, however was one of “it’s not going to hit us that badly”. 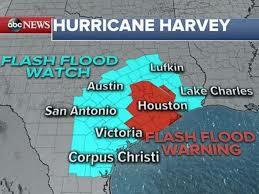 Hurricane Harvey was predicted to make landfall in Corpus Christi, Texas. Interestingly, Corpus Christi means Body of Christ which refers to the Church. The Church is His Body living on the earth today. On Saturday August 26, 2017 abc13 news headlines reported “Corpus Christi emerges from Hurricane Harvey relatively unscathed”. Sadly in other places, like Rockport, Texas the damage is described as catastrophic. While there was property damage in Corpus Christi, the report concluded “Miraculously, no injuries have been reported within city limits.” We do thank God for this! But, can we just take God’s protection for granted? What is God saying to the Church, His Body through this natural storm? Our nation is experiencing a huge moral decline. Unrighteousness is rampant. We are heading towards lawlessness and anarchy. Yet, many in the Church sit in their recliner, feeding on junk food messages and are not changed into Christ’s image. If not in the recliner, then they are “too busy” with the things of this world like constant work, entertainment, sports and running here and there. They participate in ungodly living thinking that somehow they are “good to go” because they claim to be a Christian. Jesus called us to Himself – not the TV and not ‘going to church’. He called us to prayer, service and laying our lives down for one another. He called us to focus and perseverance. We must repent of complacency and apathy. We cannot be a people of “whatever will be, will be”. We must have the mind of Christ! The Bible tells us that we can have it, but we must be willing to lay down our own ideas and “stinking thinking”. We need the cleansing power of the Word of God to wash our minds. In Isaiah 55:9 God tells us that “As the heavens are higher than the earth, so are my ways higher than your ways and my thoughts than your thoughts.” HIS Word does not return empty, but accomplishes HIS purposes, which brings blessing and fruitfulness to our lives. It brings peace and joy even in the midst of difficult circumstances. (Read Isaiah 55: 10 – 13). We must contend for this mindset. It requires our due diligence and effort! It requires that we read and study God’s Word, the Bible for ourselves. It requires humbling ourselves and prayer. We cannot just breathe a sigh of relief if this storm hasn’t hit us hard or even at all. What about our neighbor? What about our children and grandchildren? What about the future of our nation? What about the next storm? Read what the LORD says in Zephaniah 2: 1-3. Seek the Lord, seek righteousness, seek humility. Gather together, O shameful nation. NOW Is the time! The Church in the United States is seeing some BIG signs within this last week. One week ago today we experienced Solar Eclipse 2017. The week ended with one of the biggest Hurricanes to hit Texas ever. Now downgraded to a Tropical Storm, Harvey is still causing much damage and heavy flooding which is expected to continue through this Friday September 1, 2017. The after effects are sure to continue for a long time. Are we understanding the times and are we doing what God shows us to do in His Word? I sincerely pray so. RIGHT NOW, you can pray and act to help in Texas by giving to a Christian Relief Organization such as Samaritan’s Purse. 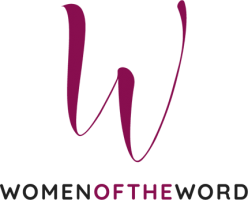 At Women of the Word we are calling women to corporate prayer, worship and godly living for the sake of our families and nation. We are also calling them to put action behind their prayers so that others will see Jesus loves them and cares for them. Please do likewise. Get out of complacency and apathy. Stop just doing the minimum thinking that is enough preparation. Be strong in the Lord so you are ready to face any storm in life with courage, knowing God will bring you through! What does Solar Eclipse 2017 mean to Women of the Word? Many thousands, perhaps millions of people will gather throughout the United States to watch the solar eclipse, the wonder in the heavens. The total solar eclipse will be seen primarily in the United States. Will they ask “What does this mean?” Whom will they ask? Where will they look for answers? If they look to the world they will receive conflicting and confusing answers. May they seek God for answers. May they seek for answers in the Bible, His Word. May they ask believers in Jesus and I pray that we will have biblical answers for them! God is seeking to save souls! That is His agenda and so may it be ours. The timing of this solar eclipse is significant. It is not coincidence. At sundown on Monday August 21, 2017 the Hebrew month of Elul begins. Traditionally, this is a month of repentance ushering the celebration of the LORD’s Appointed Fall Feasts (Trumpets, Day of Atonement, and Tabernacles – read Leviticus 23: 23 – 44). The Day of Atonement this year is 40 days from the solar eclipse. 40 is a number that has Biblical significance. God is speaking to our nation! We are losing our nation to immorality, violence and anarchy. It’s time to FIGHT for our generation and those coming up. God is calling us as individuals and as a nation to repentance. Repentance is not just saying “I’m sorry”. The definition is a change of mind which should lead to change in behavior. We need to ask the Lord to show us in what areas of our lives we are not pleasing Him and then commit to change, asking for His empowerment. He will most certainly give it! God is desirous of revival within the Church and a great harvest of souls! Revival within the Church comes when we humble ourselves, seek His face, pray and live according to biblical principles. We lay down our agendas of wanting to be entertained and comforted and made to feel good! We focus on God’s agenda which is winning souls and making disciples conformed to the image of Jesus. We fight in humble prayer on our knees and with fasting (when God says to). We fight with God’s Word. He has given us weapons with which to fight and these weapons are not carnal, but mighty through God to the pulling down of strongholds, casting down imaginations and every high thing that exalts itself against the knowledge of God, taking every thought captive to the obedience of Christ (2 Corinthians 10: 4,5). We fight by living lives that honor and please God. We hunger and thirst for righteousness and we live that out. 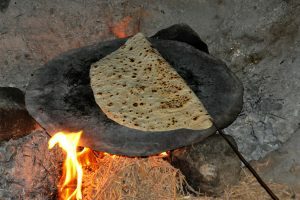 This is the greatest example to the world that we are different. This is how the Church makes known the wisdom of God (Ephesians 3:10). At Women of the Word we look to God and His Word (the Bible) for answers to life’s issues and ask God what He is saying through National and International events and issues. 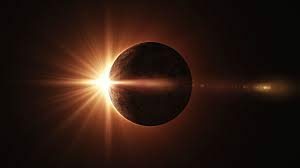 The solar eclipse of August 21, 2017 is a “wonder in the heavens…..the sun shall be turned to darkness…..” spoken of by the Apostle Peter in Acts 2: 19 & 20. God told us that there would be signs before the day of the Lord’s return. What do these signs mean and what is God saying? In general terms, these wonders and signs point us to God as the Creator of the Universe and the one who has set an order that is reliable and dependable. The sun is set! The earth moves around the sun. The moon moves around the earth. There is evening and there is morning every day! This points us to God and His Son Jesus Christ who is the same yesterday and today and forever (Hebrews 13:8). The order of the Universe reveals HIM. The context of the Apostle Peter’s declaration in Acts 2 is when the Holy Spirit filled the believers that were gathered together in unity and prayer. Thousands of Jews were gathered in Jerusalem for the Feast of Pentecost and they asked “What does this mean?”. Some thought the believers were “drunk.” Peter explained what was happening in Acts 2:17-21 referencing a prophecy through the prophet Joel (Joel 2: 28-32). In short, this prophecy tells us that God will pour out His Spirit on ALL flesh regardless of gender, ethnicity, age, status, education, etc. – ALL flesh who call on the name of the LORD Jesus for salvation. For the sake of this generation and our children and grandchildren will you fight? Will you fight as an individual and will you gather corporately? I’m saying – Here I am LORD. I will! and at Women of the Word – We will! We are starting off our upcoming conferences with a corporate concert of prayer and worship to seek the Lord and pray! There is great power when women come together to pray and worship corporately. I invite you to join us! 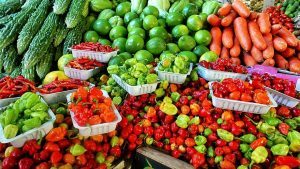 Have you noticed the latest food trend? Growing numbers of people are into artisanal foods. They love organic cheeses and heirloom vegetables, farmer’s markets and food co-ops. They want to eat slow food, not fast food. It takes more time and effort, but it’s worth it, they say. You know what? I’m into artisanal Bible study. As Christians, we all know that it’s important to sustain ourselves daily with the Scriptures. But time is short, so many of us do Bible study microwave-style nowadays. We gulp down a pre-packaged devotion with a few slurps of coffee before heading off to work. Is it at all surprising when it’s as bland and unmemorable as a vending machine sandwich? Have you ever tasted fresh pita bread made by the Bedouins? It’s out of this world—chewy and hot, crispy in spots, and a little smoky from the open fire. When a veiled, wizened old woman flops a piping hot piece into your hands, you need to rip off a chunk and pass the rest on before your fingers burn. Smeared with olive oil and dried hyssop, it’s like nothing you’ve ever tasted before. It’s the same with Hebrew words. Out of necessity for us to read them, we’ve had to “package” them into English sen- tences, like the bagged pitas you find at the grocery store. But some of their more subtle flavors simply don’t travel well across languages and time, even if their “nutritional value” hasn’t changed. In order to taste the breadth of expression of the Bible’s ancient words, you have to travel back mentally into their original Middle Eastern setting. Why Hebrew? Well, Hebrew is God’s heart language— the mother tongue of the Scriptures Jesus read. Hebrew is also an extremely rich, poetic language that looks at the world in very different ways than English. Grasping the depth of even a few words greatly clarifies and enriches reading, and casts new light on things that you thought you understood. You’ll see humor, irony and timeless wisdom where you passed it by before. Often, knowing the original, fuller sense of a biblical idea will challenge and change you, as its ancient wisdom puts your life into the perspective of God’s eternal Word. Let’s look at Hebrew words another way. Rather than being “packaged” into sentences, you could say that words themselves are packaging. Words are the luggage that we use to transport our thoughts into the minds of others. 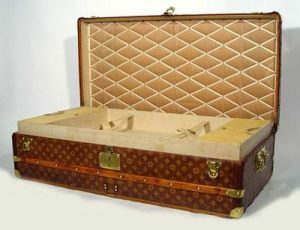 In English, we have an enormous number of “suitcases,” words with various shades of meaning and formality. Some dictionaries put the number at 100,000, some more. But believe it or not, biblical Hebrew has only about 4000 words, a tiny fraction of the vocabulary of English. You might wonder how Hebrew can communicate with so few words. The reason is that each “suitcase” is roomier inside—deeper, wider, more spacious. Many Hebrew words carry a wider range of meaning than the corresponding word in English. Unpacking the ideas within a Hebrew “suitcase” is often enormously helpful in Bible study. We English speakers are used to very precise meanings, and we expect to have everything carefully defined. But Hebrew words paint scenes in broad brushstrokes, leaving the listener to discern the meaning from the context. The prophets and biblical writers actually seemed to delight in pondering the nuances of their language. They often made wordplays based on a word’s ambiguity, deliberately invoking multiple layers of a word’s meaning. For instance, the word ruach (roo-AKH) means “breath,” “wind,” and “spirit.” When God’s ruach blew through the Valley of Dry Bones to bring new life in Ezekiel 37, we see that all of its various meanings are intended. I’ve always imagined that God chose to reveal his Word in Hebrew because the language invites us to think more deeply. As we read the Scriptures, we ask God what he is saying to us again and again. Hebrew is helpful not just for reading the Old Testament (which was mostly written in Hebrew), but the New Testament too. Although it was written in Greek, it was composed almost entirely by Jews growing up in a Hebrew-speaking, Semitic-thinking culture. Often you hear a Hebraic “accent” even in the Greek text. Knowing more about the Hebrew way of looking at the world is helpful in reading the Scriptures from beginning to end. Lois Tverberg has written a wonderful study available in e-book form entitled “5 Hebrew Words that Every Christian Should Know”. A sample of it is attached here (pdf). You can purchase the entire e-book (pdf) for $3.99 here. 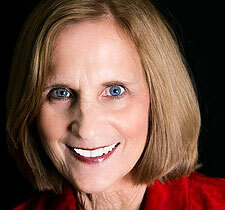 Lois is a biblical scholar, author and speaker. Women of the Word, a Christian women’s conference ministry, is blessed to have her on our speaker team. She brings great insight into understanding the Bible from its Hebraic context. This helps us to walk out biblical principles and become better disciples of Jesus. Dealing with a broken leg, foot and ankle has altered my lifestyle tremendously. Most of my days are spent sitting with my leg elevated, occasionally using a wheel chair or knee scooter for the trip to get my lunch out of the refrigerator, or make my way to my bedroom at night. My doctor’s instructions are that I am to put no weight on my foot for six to eight weeks, and keep the leg elevated. It sounds so simple, but I am so tired of the routine. Some days I just don’t want to do what it takes to get well. Yet, every day I obediently do my part. Why? Because I want to get well. I want to walk again. I want to get back to living again. I want to get well. Chapter five of the book of John relates quite a story of a man who had been crippled for thirty-eight years. He spent his days lying on a mat. Many scholars believe it was probably a small 3’ by 5’ mat that became his world by the Pool of Bethesda. He would lay there daily, hoping that it was his day of healing. Jesus asked an interesting question to the man in verse six, “Do you want to get well?” Really, Jesus? What a silly question! Perhaps it wasn’t so silly. The man’s response was to give all the reasons why he couldn’t be healed. He lived in captivity to a 3’ by 5’ world. As I talk with people, I’ve been tempted to ask, “Do you want to get well?” I hear reason after reason why they can’t get beyond the prison of their 3’ by 5’ world. I get it! I really do. I’ve known sexual abuse, miscarriage, the loss of a child, and a score of other things – things that invited me to live in a 3’ by 5’ world. It’s often more inviting to do mat time, than to walk the process of healing. My heart is gripped when I listen to the painful stories of people’s lives. Life can be brutal. I believe many must answer the question, “Do you want to get well?” Sometimes the journey is slow and difficult. As with my leg, we will sometimes still feel the pain while awaiting the healing to be completed. Jesus came to deliver us from a 3’ by 5’ life. We won’t always receive instant healing. We certainly can’t turn back the clock and erase what brought pain and brokenness into our lives. Jesus sought out a man who needed healing. Jesus is always seeking those who are broken, and need His healing. Let’s try to unpack this question by looking at it in a different light. Perhaps Jesus was digging deeper and asking things like: Do you really want things to change? Are you ready to leave behind all of the excuses? Do you ever feel like you are stuck in a 3’ by 5’ world? Enter Jesus! There is a big world out there, so don’t let pain and brokenness keep you on the mat. Jesus is ready to help you get off that mat, and walk into healing. As I stare at this elevated, black-casted leg, I wish it was instantly healed. I wish I could turn back time and change that moment that brought such pain and discomfort to my life. It would be easy to wallow in my sorrow and pain. But … I want healing. I want to get beyond the pain, and off the limitations of a 3’ by 5’ world. I do the things I need to do for healing. Therapy is down the road, and I will do the things I need to do for healing. I want to get well. Do you? Barbara Benton is a regular speaker at Women of the Word, a Christian women’s conference ministry. She teaches life application of biblical principles in down to earth and humorous ways. Barbara desires to live a life that honors God and help others do the same. Find out more here. I still remember how it felt when I missed the final step and went sailing into the air, landing on my right foot. As I lay in all my glory on my son’s living room floor, with the whole family as an audience, I knew my foot was severely injured. While I won’t bore you with the whole story and all the details, suffice it to say it was a long night in the hospital in Baton Rouge. At times the pain was breathtaking, and I could feel myself getting more and more anxious. Everything in me felt like saying, “Hey, I’m in pain over here. What’s the holdup!” I could roll my eyes, sigh with exaggeration and demand to speak to someone. That’s what I felt like doing. While in severe pain, I made up my mind that I was going to be nice to all the personnel who would be assisting me that night. We were in an emergency room, with a lot of people waiting. That meant lots of needs, lots of pain, lots of impatience. The choice was mine. How would I act and how would I react? It was a long, painful night, with lots of slowdowns and lots of beating around the bush as to what should be done with my broken toe, foot, ankle and leg. I chose niceness. I was in enough pain to want to be anything but nice, but nice and treating people respectfully would be my choice. After many hours of dealing with many different people, which eventually turned into several days of dealing with different people, I made a decision daily and sometimes hourly to just be nice and kind. I expressed my needs, my pain and my desires, but nicely. Another marvelous thing happened: some of the employees would come by and visit. Some began to share their stories, and I was able to talk about the power of God. I thought one worker would have revival in the middle of the night! Don’t miss the point of this short blog. My purpose is not to pat myself on the back. My purpose is to remind us, that God is with us in our pain. God will bring healing to our pain, and in most instances, it will be a journey, that seems slow and never-ending. (My days of immobility seem soooooo long.) But, God will bring healing to our pain. Whether to scream at everyone, take it out on everyone, and be rude to others is a choice. As you read this, I am in no way minimizing pain, any kind of pain: physical, betrayal, emotional, grief, marginalization. Pain is real, very real. And sometimes we do cry out because of our pain, and hopefully we have people with whom we can share our pain. So this is not a guilt trip blog. My goal, as a child of God, is to let God do my talking, not my pain. I trust God with the pain. He sees. He cares. He wipes tears. 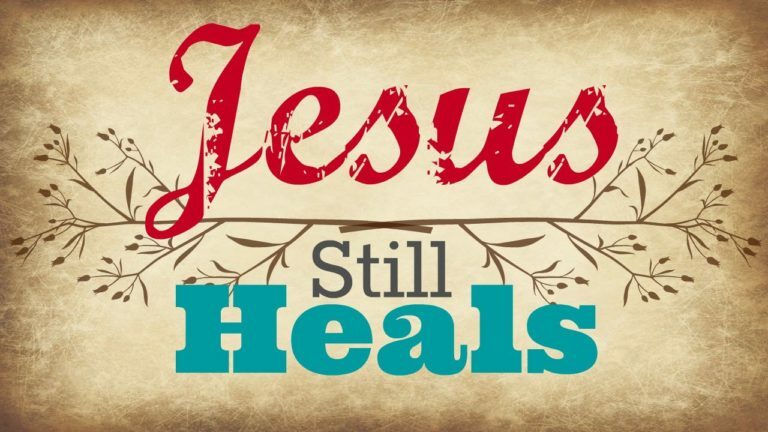 He heals. In the mean time, try a little kindness.